The Growth Coach International business coaching franchise opportunity is looking for you! The Growth Coach’s international business coaching franchise opportunity of business and sales coaching programs are remarkably portable to business cultures around the world. In fact, we’re already operating in 16 countries, and we’re looking to grow into new regions, as well. Brand President Ray Fabik points to the successful launch of The Growth Coach in Ecuador, where our proprietary programs have been adapted into one-year coaching systems. We’re actively looking for individuals to lead The Growth Coach in their country. From South America to Europe, Asia and beyond, we’re bringing The Growth Coach to new business audiences all the time. You can be a part of The Growth Coach by becoming a Master Franchise in your country. Bringing The Growth Coach to your country provides you the opportunity to sell franchises to local entrepreneurs, while you’ll also be making a huge impact in your business community, helping owners, business leaders and sales executives maximize their business and personal potential. Find out more about the qualities we’re looking for in potential Master Franchise partners. What are the Qualifications to Become a Master Franchise? Think you have what it takes to bring The Growth Coach international business coaching franchise opportunity to your country? Let’s get started! The Growth Coach programs are remarkably portable, and they’ve already been adapted for Latin American audiences, European markets, and in numerous languages and cultures around the world. We’re in 16 countries, and we want to bring our expertise to market everywhere. We’ve identified a host of international markets where we think The Growth Coach is primed and ready for international expansion. Find out more and, if your country isn’t on the list, reach out to us and let us know why The Growth Coach would be great for your corner of the world. Where Are Available International Markets? The Growth Coach is expanding in the international marketplace. We’re seeking highly motivated, business-minded Master Franchise partners to align with the brand and help small business owners succeed. International Master Franchise partners are responsible for opening an initial location, selling and supporting sub-franchisees throughout their country, and will receive the majority of Franchise Fee and royalty income. 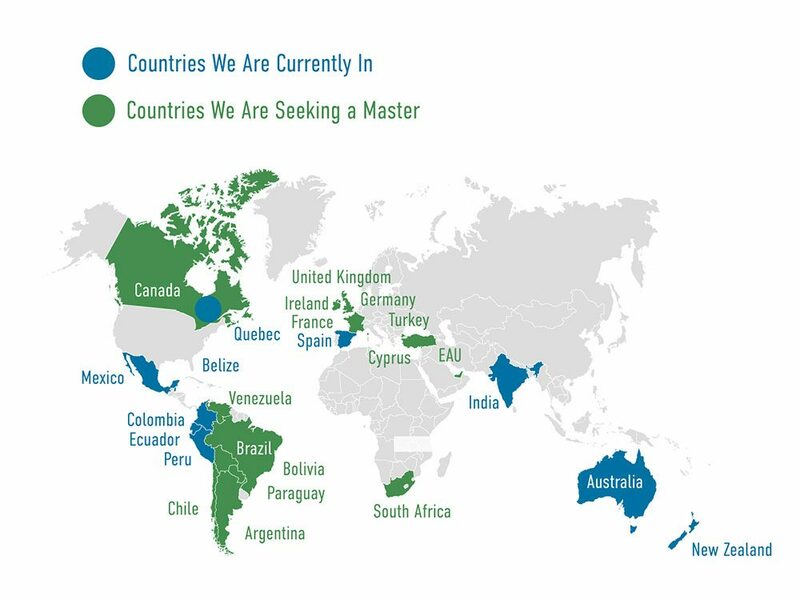 Here are just a few of the regions where we are actively seeking a Master Franchise. If your country of interest is not specifically listed, please reach out to us to discuss options. The Growth Coach is a cost-effective, internationally expanding franchise with initial investment fees dependent on the size of the region/county of investment, number of sub-franchisees, and the level of demographics. Fees include working capital, start-up costs, and the Master Franchise fee. What are my responsibilities as a Master Franchise? You will be the chief brand ambassador for The Growth Coach in your country. This means you’ll actively promote the brand, recruit potential franchise owners, and grow a network of thriving Growth Coach locations throughout the country. At the same time, you’ll be a vital link between The Growth Coach management and development team and your market, assisting with adapting our programs to your business climate. What are the benefits of becoming a Master Franchise? In addition to becoming a Growth Coach yourself, you’ll earn revenues from the Franchise Fee and Royalties produced in your market, most of which flow directly to you. You’ll also become a leader in the franchising industry within your country, an expert in your field and someone business leaders turn to for guidance and advice. How much does it cost to become a Master Franchise? That’s a question that depends largely on the nation you’re seeking to represent, the type of business markets and climates that exist there, and hundreds of other factors. The best way to determine how much the investment will be is to contact us today and start the discussion. What if there’s already a Master Franchise in my country? Even if The Growth Coach is already an established presence in your country, you can still become a part of our family. Become a Growth Coach with a territory of your own. Contact the Master Franchise in your country for more information about joining our innovative business coaching franchise.